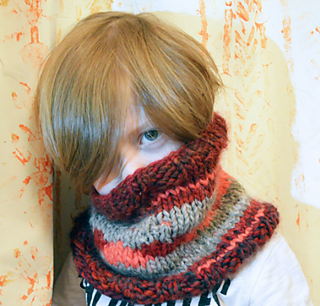 This pattern is my own design for a very quick knit cowl in a child’s size. 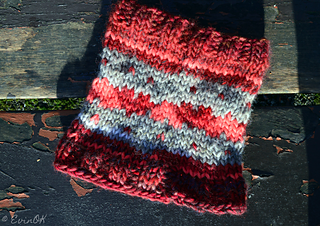 The stranded colorwork heart design is done with three colours. 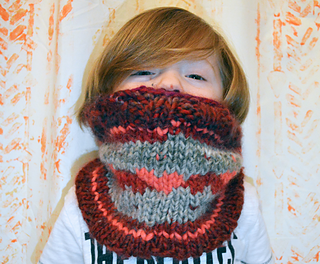 A strand of hearts facing up and down make this cowl right side up in any direction. 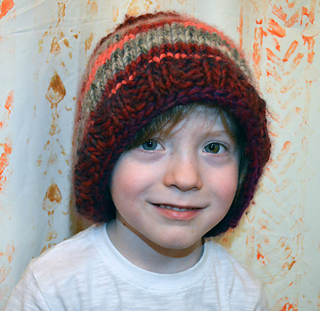 This design grew out my desire to have something to keep my own son’s neck, ears and chin warm. There always seems to be a gap between his coat and his hat – and he hates the tightness of the top snap on his coat being done up. But a cowl is ideal. Shown here around the neck or worn over the ears like a “ninja headband” (the model’s words, not mine). Since it’s not a scarf, you also don’t need to worry about it dragging on the ground behind them or being used as a rope to climb trees. Not that kids do that. No, of course not. 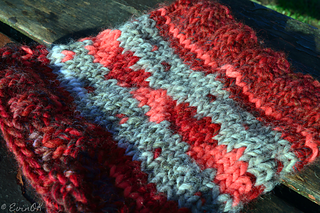 Knit and Purl; Basic Increase and Decrease; Knit In The Round; Beginner Fair Isle Skills. Gauge is not essential for size, only for visibility of colorwork so it is not specified in the written pattern.